CARFAX 1-Owner, BMW Certified. FUEL EFFICIENT 28 MPG Hwy/20 MPG City! Moonroof, Heated Seats, iPod/MP3 Input, Power Liftgate, CD Player, Onboard Communications System, Dual Zone A/C, PARK DISTANCE CONTROL, HEATED FRONT SEATS AND MORE! KEY FEATURES INCLUDE Sunroof, All Wheel Drive, Turbocharged, Aluminum Wheels, Brake Actuated Limited Slip Differential MP3 Player, Keyless Entry, Remote Trunk Release, Privacy Glass, Child Safety Locks. OPTION PACKAGES HEATED FRONT SEATS, POWER FRONT BUCKET SEATS 8-way power adjustable front seats w/2-way manual headrests (STD). BMW xDrive28i with Jet Black exterior and Beige SensaTec interior features a 4 Cylinder Engine with 240 HP at 5000 RPM*. EXPERTS RAVE Edmunds.com explains In any form, the X4 exhibits excellent high-speed stability and generally holds road noise to an absolute minimum.. Great Gas Mileage: 28 MPG Hwy. SHOP WITH CONFIDENCE Unlimited Miles for 1-Year plus the balance of original new vehicle warranty (4-Year/50,000-Miles), 24-Hour BMW Roadside Assistance, Comprehensive Inspection and Reconditioning, Trip-Interruption Services, Trip-Planning Services MORE ABOUT US Family owned for over 50 years, Competition BMW of Smithtown has been providing exceptional customer service to the Smithtown, New York area. We strive to exceed your expectations when buying your next car. The experienced and professional sales team at Competition BMW isn't satisfied until you are driving off of the lot in the car that is perfect for you, and your lifestyle. Horsepower calculations based on trim engine configuration. Fuel economy calculations based on original manufacturer data for trim engine configuration. Please confirm the accuracy of the included equipment by calling us prior to purchase. Serviced here, Non-Smoker vehicle, EPA 33 MPG Hwy/23 MPG City! CARFAX 1-Owner, Excellent Condition, GREAT MILES 5,154! Navigation, Moonroof, Heated Seats, All Wheel Drive, iPod/MP3 Input, CD Player, Back-Up Camera, Rear Air, Turbo Charged, HEATED FRONT SEATS AND MORE! KEY FEATURES INCLUDE Onboard Communications System, Dual Zone A/C Child Safety Locks, Steering Wheel Controls, Electronic Stability Control, Heated Mirrors, Bucket Seats. OPTION PACKAGES CONVENIENCE PACKAGE Moonroof, SiriusXM Satellite Radio, 1 year All Access subscription, Comfort Access Keyless Entry, Lumbar Support, NAVIGATION SYSTEM Remote Services, Advanced Real-Time Traffic Information, Instrument Cluster w/Extended Contents, WHEELS: 18 X 8 DOUBLE-SPOKE (STYLE 397) Tires: P225/45R18 All-Season Runflat, ACTIVE BLIND SPOT DETECTION, HEATED FRONT SEATS, HEATED STEERING WHEEL. BMW 330i xDrive with Jet Black exterior and Black w/Red Stitching interior features a 4 Cylinder Engine with 248 HP at 5200 RPM*. . VEHICLE REVIEWS If you're seeking a midsize-performance sedan with an unquestioned reputation for performance, quality, luxury and safety Great Gas Mileage: 33 MPG Hwy. 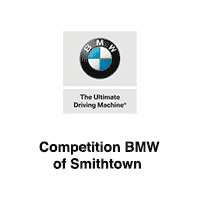 MORE ABOUT US Family owned for over 50 years, Competition BMW of Smithtown has been providing exceptional customer service to the Smithtown, New York area. We strive to exceed your expectations when buying your next car. The experienced and professional sales team at Competition BMW isn't satisfied until you are driving off of the lot in the car that is perfect for you, and your lifestyle. Pricing analysis performed on 4/13/2019. Horsepower calculations based on trim engine configuration. Fuel economy calculations based on original manufacturer data for trim engine configuration. Please confirm the accuracy of the included equipment by calling us prior to purchase. FUEL EFFICIENT 29 MPG Hwy/22 MPG City! CARFAX 1-Owner, GREAT MILES 5,245! NAV, Sunroof, Heated Seats, All Wheel Drive, Back-Up Camera, iPod/MP3 Input, Rear Air, Power Liftgate, Turbo, HEATED FRONT SEATS, CONVENIENCE PACKAGE READ MORE! KEY FEATURES INCLUDE Turbocharged, CD Player, Onboard Communications System, Dual Zone A/C Rear Spoiler, Privacy Glass, Steering Wheel Controls, Child Safety Locks, Electronic Stability Control. OPTION PACKAGES CONVENIENCE PACKAGE LED Headlights w/Cornering Lights, Panoramic Moonroof, SiriusXM Satellite Radio, 1 year All Access subscription, Comfort Access Keyless Entry, Lumbar Support, NAVIGATION SYSTEM Remote Services, Advanced Real-Time Traffic Information, PARK DISTANCE CONTROL, WHEELS: 19 X 7.5 (STYLE 692) V-spoke, Bi-color, Ferric Grey, Tires: 245/50R19 AS Run-Flat, HEATED STEERING WHEEL. BMW xDrive30i with Dark Graphite Metallic exterior and Black Vernasca Leather interior features a 4 Cylinder Engine with 248 HP at 5200 RPM*. EXPERTS REPORT The X3 offers all-day driving comfort. It has supportive seats with wide-ranging adjustments and a hushed interior, particularly at a stop. -Edmunds.com. Great Gas Mileage: 29 MPG Hwy. WHO WE ARE Family owned for over 50 years, Competition BMW of Smithtown has been providing exceptional customer service to the Smithtown, New York area. We strive to exceed your expectations when buying your next car. The experienced and professional sales team at Competition BMW isn't satisfied until you are driving off of the lot in the car that is perfect for you, and your lifestyle. Horsepower calculations based on trim engine configuration. Fuel economy calculations based on original manufacturer data for trim engine configuration. Please confirm the accuracy of the included equipment by calling us prior to purchase. Serviced here, Non-Smoker vehicle, Excellent Condition, CARFAX 1-Owner, ONLY 6,646 Miles! FUEL EFFICIENT 33 MPG Hwy/23 MPG City! Heated Seats, NAV, Sunroof, iPod/MP3 Input, Back-Up Camera, CD Player, Onboard Communications System, All Wheel Drive, Turbo SEE MORE! KEY FEATURES INCLUDE Navigation, Turbocharged, Aluminum Wheels, Dual Zone A/C MP3 Player, Steering Wheel Controls, Child Safety Locks, Electronic Stability Control, Heated Mirrors. OPTION PACKAGES PREMIUM PACKAGE Heated Front Seats, Power Tailgate, Park Distance Control, SiriusXM Satellite Radio, Gesture Control, Comfort Access Keyless Entry, DRIVING ASSISTANCE PACKAGE Head-Up Display, Active Driving Assistant, blind spot detection, daytime pedestrian protection, frontal collision warning w/city collision mitigation, lane departure warning, speed limit info and cross-traffic alert rear, Active Blind Spot Detection, Lane Departure Warning, HEATED STEERING WHEEL. BMW 530i xDrive with Black Sapphire Metallic exterior and Black interior features a 4 Cylinder Engine with 248 HP at 5200 RPM*. . EXPERTS REPORT Great Gas Mileage: 33 MPG Hwy. WHO WE ARE Family owned for over 50 years, Competition BMW of Smithtown has been providing exceptional customer service to the Smithtown, New York area. We strive to exceed your expectations when buying your next car. The experienced and professional sales team at Competition BMW isn't satisfied until you are driving off of the lot in the car that is perfect for you, and your lifestyle. Pricing analysis performed on 4/20/2019. Horsepower calculations based on trim engine configuration. Fuel economy calculations based on original manufacturer data for trim engine configuration. Please confirm the accuracy of the included equipment by calling us prior to purchase. CARFAX 1-Owner, Excellent Condition, LOW MILES - 4,502! FUEL EFFICIENT 31 MPG Hwy/21 MPG City! Navigation, Heated Seats, Moonroof, Power Liftgate, Rear Air, Premium Sound System, Back-Up Camera, All Wheel Drive, Turbo Charged CLICK NOW! KEY FEATURES INCLUDE Navigation, Sunroof, Turbocharged, Satellite Radio, iPod/MP3 Input, Onboard Communications System, Aluminum Wheels, Keyless Start, Dual Zone A/C. Keyless Entry, Remote Trunk Release, Child Safety Locks, Steering Wheel Controls, Electronic Stability Control. OPTION PACKAGES CONVENIENCE PACKAGE Heated Front Seats, Active Blind Spot Detection, WIRELESS CHARGING Enhanced USB & Bluetooth, Adjustable Front Armrest, WiFi Hotspot, HEATED STEERING WHEEL. BMW 440i xDrive with Black Sapphire Metallic exterior and Black/Dark Oyster interior features a Straight 6 Cylinder Engine with 320 HP at 5500 RPM*. VEHICLE REVIEWS Edmunds.com explains The steering's accuracy and directness are ideal for a luxury coupe, and the thick M Sport steering wheel feels good in your hands.. Great Gas Mileage: 31 MPG Hwy. WHO WE ARE Family owned for over 50 years, Competition BMW of Smithtown has been providing exceptional customer service to the Smithtown, New York area. We strive to exceed your expectations when buying your next car. The experienced and professional sales team at Competition BMW isn't satisfied until you are driving off of the lot in the car that is perfect for you, and your lifestyle. Horsepower calculations based on trim engine configuration. Fuel economy calculations based on original manufacturer data for trim engine configuration. Please confirm the accuracy of the included equipment by calling us prior to purchase. CARFAX 1-Owner, LOW MILES - 8,116! EPA 29 MPG Hwy/20 MPG City! Nav System, Moonroof, Heated Leather Seats, Turbo Charged Engine, iPod/MP3 Input, Back-Up Camera, All Wheel Drive, HEAD-UP DISPLAY, HEATED STEERING WHEEL CLICK ME! KEY FEATURES INCLUDE Leather Seats, Navigation, Sunroof, Turbocharged, CD Player, Onboard Communications System, Aluminum Wheels, Dual Zone A/C, Smart Device Integration Steering Wheel Controls, Child Safety Locks, Heated Mirrors, Electronic Stability Control, Bucket Seats. OPTION PACKAGES PREMIUM PACKAGE Heated Front Seats, Power Tailgate, Park Distance Control, SiriusXM Satellite Radio, Gesture Control, Comfort Access Keyless Entry, WIRELESS CHARGING Enhanced USB & Bluetooth (ZEB), WiFi Hotspot, HEATED STEERING WHEEL. BMW 540i xDrive with Alpine White exterior and Black Dakota Leather interior features a Straight 6 Cylinder Engine with 335 HP at 5500 RPM*. EXPERTS RAVE KBB.com explains If you want a midsize-luxury sedan with all the expected premium trappings, loads of technology and an edge for drivers who favor sporty driving dynamics, the 2018 BMW 5 Series remains the one to beat.. Great Gas Mileage: 29 MPG Hwy. WHY BUY FROM US Family owned for over 50 years, Competition BMW of Smithtown has been providing exceptional customer service to the Smithtown, New York area. We strive to exceed your expectations when buying your next car. The experienced and professional sales team at Competition BMW isn't satisfied until you are driving off of the lot in the car that is perfect for you, and your lifestyle. Horsepower calculations based on trim engine configuration. Fuel economy calculations based on original manufacturer data for trim engine configuration. Please confirm the accuracy of the included equipment by calling us prior to purchase. Serviced here, Non-Smoker vehicle, EPA 28 MPG Hwy/19 MPG City! CARFAX 1-Owner, Excellent Condition, LOW MILES - 24,658! Navigation, Heated Leather Seats, Sunroof, Premium Sound System, Back-Up Camera, Turbo Charged, Rear Air, All Wheel Drive, EXECUTIVE PACKAGE CLICK NOW! KEY FEATURES INCLUDE Leather Seats, Navigation, Satellite Radio, iPod/MP3 Input, Onboard Communications System, Dual Moonroof, Keyless Start, Dual Zone A/C, Smart Device Integration, Hands-Free Liftgate. MP3 Player, Keyless Entry, Child Safety Locks, Steering Wheel Controls, Electronic Stability Control. OPTION PACKAGES EXECUTIVE PACKAGE Instrument Panel w/Nappa Leather Finish, Power Rear Sunshade & Rear Side Window Shades, Head-Up Display, Multi-Contour Seats, Ceramic Controls, DRIVER ASSISTANCE PLUS Active Driving Assistant, Surround View w/3D View, Blind Spot Detection, Parking Assistant w/Active Park Distance Control, Frontal Collision Warning, city collision mitigation, Speed Limit Info, Daytime Pedestrian Protection, Lane Departure Warning, DRIVER ASSISTANCE PLUS II Active Driving Assistant Plus, Active Cruise Control w/Stop & Go, Traffic Jam Assistant, Active Lane Keeping Assistant, side collision avoidance, WHEELS: 19 X 8.5 LIGHT ALLOY V-SPOKE Style 620, Tires: P245/45R19 AS Run-Flat, COLD WEATHER PACKAGE Front & Rear Heated Seats, Heated Steering Wheel, GRAY POPLAR WOOD TRIM, TRANSMISSION: SPORT AUTOMATIC (STD). . OUR OFFERINGS Family owned for over 50 years, Competition BMW of Smithtown has been providing exceptional customer service to the Smithtown Pricing analysis performed on 4/20/2019. Horsepower calculations based on trim engine configuration. Fuel economy calculations based on original manufacturer data for trim engine configuration. Please confirm the accuracy of the included equipment by calling us prior to purchase. CARFAX 1-Owner, ONLY 3,576 Miles! FUEL EFFICIENT 33 MPG Hwy/23 MPG City! Moonroof, Heated Seats, Nav System, Turbo Charged Engine, iPod/MP3 Input, CD Player, Back-Up Camera, All Wheel Drive, FRONT & REAR HEATED SEATS CLICK NOW! KEY FEATURES INCLUDE Navigation, Sunroof, Turbocharged, Onboard Communications System, Dual Zone A/C, Smart Device Integration MP3 Player, Child Safety Locks, Steering Wheel Controls, Heated Mirrors, Electronic Stability Control. OPTION PACKAGES PREMIUM PACKAGE Heated Front Seats, Power Tailgate, Park Distance Control, SiriusXM Satellite Radio, Gesture Control, Comfort Access Keyless Entry, DRIVING ASSISTANCE PLUS PACKAGE Active Driving Assistant Plus, active cruise control w/stop and go, active lane keeping assistant w/side collision avoidance, traffic jam assistant and evasion aid and cross-traffic alert front, DRIVING ASSISTANCE PACKAGE Head-Up Display, Active Driving Assistant, blind spot detection, daytime pedestrian protection, frontal collision warning w/city collision mitigation, lane departure warning, speed limit info and cross-traffic alert rear, Active Blind Spot Detection, Lane Departure Warning, WHEELS: 19 X 8 V-SPOKE (STYLE 635) Tires: 245/40R19 AS Run-Flat, FRONT & REAR HEATED SEATS, HEATED STEERING WHEEL. OUR OFFERINGS Family owned for over 50 years, Competition BMW of Smithtown has been providing exceptional customer service to the Smithtown, New York area. We strive to exceed your expectations when buying your next car. The experienced and professional sales team at Competition BMW isn't satisfied until you are driving off of the lot in the car that is perfect for you, and your lifestyle. Horsepower calculations based on trim engine configuration. Fuel economy calculations based on original manufacturer data for trim engine configuration. Please confirm the accuracy of the included equipment by calling us prior to purchase. EPA 24 MPG Hwy/18 MPG City! CARFAX 1-Owner, LOW MILES - 2,638! NAV, Sunroof, Heated Seats, All Wheel Drive, Power Liftgate, Onboard Communications System, CD Player, Back-Up Camera, Turbo, FINELINE OAK WOOD TRIM, Alloy Wheels CLICK ME! KEY FEATURES INCLUDE Navigation, Heated Driver Seat, Turbocharged, Dual Moonroof, Aluminum Wheels Rear Spoiler, Privacy Glass, Child Safety Locks, Steering Wheel Controls, Electronic Stability Control. OPTION PACKAGES PREMIUM PACKAGE 4-Zone Automatic Climate Control, SiriusXM Satellite Radio, Comfort Access Keyless Entry, WIRELESS CHARGING Enhanced USB & Bluetooth (ZEB), WiFi Hotspot, HEATED STEERING WHEEL, TRANSMISSION: SPORT AUTOMATIC (STD). BMW xDrive35i with Jet Black exterior and Black Dakota Leather interior features a Straight 6 Cylinder Engine with 300 HP at 5800 RPM*. EXPERTS ARE SAYING Not only is the interior warmly appealing, it provides abundant space for five adult occupants. Cargo space is plentiful, totaling 23 cubic feet with rear seatbacks up, expanding to 66 cubic feet when they're folded. -newCarTestDrive.com. Great Gas Mileage: 24 MPG Hwy. WHY BUY FROM US Family owned for over 50 years, Competition BMW of Smithtown has been providing exceptional customer service to the Smithtown, New York area. We strive to exceed your expectations when buying your next car. The experienced and professional sales team at Competition BMW isn't satisfied until you are driving off of the lot in the car that is perfect for you, and your lifestyle. Pricing analysis performed on 4/13/2019. Horsepower calculations based on trim engine configuration. Fuel economy calculations based on original manufacturer data for trim engine configuration. Please confirm the accuracy of the included equipment by calling us prior to purchase. CARFAX 1-Owner, ONLY 4,819 Miles! FUEL EFFICIENT 24 MPG Hwy/18 MPG City! Nav System, Heated Leather Seats, Moonroof, iPod/MP3 Input, Power Liftgate, Aluminum Wheels, All Wheel Drive, Turbo Charged Engine, PREMIUM PACKAGE SEE MORE! KEY FEATURES INCLUDE Leather Seats, Navigation, Sunroof, Heated Driver Seat, Turbocharged, Onboard Communications System, Smart Device Integration, Heated Seats Remote Trunk Release, Privacy Glass, Child Safety Locks, Steering Wheel Controls, Electronic Stability Control. OPTION PACKAGES DRIVING ASSISTANCE PACKAGE Speed Limit Information, Head-Up Display, Active Driving Assistant, Active Blind Spot Detection, Lane Departure Warning, MULTI-CONTOUR SEATS, PREMIUM PACKAGE 4-Zone Automatic Climate Control, SiriusXM Satellite Radio, Comfort Access Keyless Entry, harman/kardon SURROUND SOUND SYSTEM, PARKING ASSISTANCE PACKAGE Surround View Cameras, Parking Assistant, WIRELESS CHARGING Enhanced USB & Bluetooth (ZEB), WiFi Hotspot, HEATED REAR SEATS, HEATED STEERING WHEEL, FINELINE OAK WOOD TRIM. BMW xDrive35i with Black Sapphire Metallic exterior and Black Dakota Leather interior features a Straight 6 Cylinder Engine with 300 HP at 5800 RPM*. BUY FROM AN AWARD WINNING DEALER Family owned for over 50 years, Competition BMW of Smithtown has been providing exceptional customer service to the Smithtown, New York area. We strive to exceed your expectations when buying your next car. The experienced and professional sales team at Competition BMW isn't satisfied until you are driving off of the lot in the car that is perfect for you, and your lifestyle. Horsepower calculations based on trim engine configuration. Fuel economy calculations based on original manufacturer data for trim engine configuration. Please confirm the accuracy of the included equipment by calling us prior to purchase. Serviced here, Non-Smoker vehicle, Originally bought here, CARFAX 1-Owner, Spotless, ONLY 750 Miles! Navigation, Heated Leather Seats, Satellite Radio, iPod/MP3 Input, Onboard Communications System, Premium Sound System, TRANSMISSION: 6-SPEED MANUAL, M DRIVER'S PACKAGE, Turbo Charged CLICK ME! KEY FEATURES INCLUDE Leather Seats, Navigation, Heated Driver Seat, Turbocharged, Premium Sound System, Satellite Radio, iPod/MP3 Input, Onboard Communications System, Aluminum Wheels, Keyless Start, Dual Zone A/C, Heated Seats, Heated Leather Seats. Rear Spoiler, MP3 Player, Keyless Entry, Steering Wheel Controls, Heated Mirrors. OPTION PACKAGES TRANSMISSION: 6-SPEED MANUAL (STD). BMW M2 Coupe with Alpine White exterior and Black w/Blue Stitching interior features a Straight 6 Cylinder Engine with 365 HP at 6500 RPM*. Serviced here, Non-Smoker vehicle, Originally bought here. EXPERTS ARE SAYING The front seats feature aggressive side bolstering for excellent support when cornering hard, but they remain fairly comfortable after several hours behind the wheel. -Edmunds.com. WHO WE ARE Family owned for over 50 years, Competition BMW of Smithtown has been providing exceptional customer service to the Smithtown, New York area. We strive to exceed your expectations when buying your next car. The experienced and professional sales team at Competition BMW isn't satisfied until you are driving off of the lot in the car that is perfect for you, and your lifestyle. Pricing analysis performed on 4/17/2019. Horsepower calculations based on trim engine configuration. Please confirm the accuracy of the included equipment by calling us prior to purchase.